Realize you take risks every day. Getting up, answering the phone, and heading out the door are all risks, albeit minor ones. However, every time you do those things you’re putting yourself out there—you’re even risking rejection daily in your professional and personal life. You do these things every day and survive. Trust me, it won’t kill you. You are very capable of risk taking. Now it’s time to ramp it up. You’ve already got a toe in the water so jumping in the rest of the way isn’t as big a shock. Taking risks is a state of mind. Knowing you can do it on a small scale makes it a lot easier to start taking risks on a larger one. Find comfort in the uncomfortable. Life begins at the end of your comfort zone. You don’t have to go sky diving or base jumping—although you certainly can if you want—but you do have to go beyond doing what you’re used to doing and stretch out into new territory. Learn where you’re most comfortable, most skilled, and most proficient – and then step right past that to a place where you feel the most uncomfortable, the most uncertain, and the most unsure of yourself. That’s where the real progress begins. Consider any world class athlete, artist, or entrepreneur. No matter what their area of expertise, they put in the hours and continually push the limits to achieve beyond what anyone thought possible. You don’t break world records – or break out of ruts – without making that push. Risk it right now. At this very moment you have everything you need. Sound impossible? It happens to be true, you just may not appreciate it. Do you have food, clothing and shelter? Then you have everything you need and, once you live by this simple philosophy, taking risks becomes far easier. The most important part of this notion is that most business opportunities don’t wait around, so take action now. Don’t make the mistake of waiting on someone or something to come along to make taking that leap of faith more viable. “Perfect timing” is a fallacy—there are few if any such moments in life. Don’t wait so long that you can’t take a risk even when you want to, only to be consumed with remorse for what “could have been.” Now is the time to capitalize on opportunities that present. Make it so. Do your own thing and do it your way. The concept of going your own way and doing your own thing is not new. The problem is, most people don’t do it because it bucks tradition and goes against the grain, and frankly, it scares the s#%! out of most people. But on the other hand, it can provide you with a hell of a lot of freedom, and provide you a life-long exemption from blindly or reluctantly following protocol. Mavericks live according to their own agenda and goals and, even in the corporate world, there is more latitude to blaze new trails in business than you might think. The key is to look at each task for the opportunities they present. Sure, there may be a “perfectly fine” or traditional way of doing something to achieve a good result. But, when you have a better approach or process in mind that can achieve an even more desirable result, it may just be time to go rogue. In today’s cut-throat culture, originality is perhaps your greatest gift. Use it. Fail. Don’t just give yourself permission to fail. Actually fail. Go out there and fall on your face. It’s the only way you’re really going to learn anything. The lessons you learn from those failures will be the ones that propel you to success. Here’s an idea: try living life like a two year old. In other words, fall down often, screw up repeatedly and occasionally be defiant. Children are extremely resilient and, as adults, we lose this enviable quality. Throughout our career we proverbially fall down, get bruised and even skin our knees. We might even literally shed a few tears. But, perseverance and tenacity, honed with hindsight-based perspective so as to not repeat the same mistakes, are key to staying the course up the ladder of achievement. Repeat. Taking risks is not a “one and done” proposition. It takes tenacity, the ability to keep forging ahead, trying new things, and pushing past obstacles to achieve results. Tenacity determines how hard we fight for our dreams. A tenacious person never has to look back at all the missed opportunities. Once you take that first dive off the edge of the cliff, subsequent dives become a lot easier. In fact, they become a way of life. After experiencing the exhilaration and ROI of risk taking, you’ll wonder how you ever lived without it. Scott Petinga is Chairman and CEO of The Scott Petinga Group. He is a pioneer in developing businesses with lasting impact in the fields of communications, sustainable real estate, business acceleration and philanthropy. Through his flagship company AKQURACY—a full-service, data-fueled communications agency—he earned a spot on the prestigious 2012 Inc. magazine list of fastest-growing private companies. He may be reached online at www.ScottPetinga.com. Enlarge / Welcome to 1999, friends! Everyone, buy Apple stock, trust me. The above is a lightly edited conversation between Senior Reviews Editor Lee Hutchinson and Automotive Editor Jonathan Gitlin in the Ars staff IRC channel on July 22. Using Mac OS 9 did not initially seem like such a “great idea” to me, however. I’m not one for misplaced nostalgia; I have fond memories of installing MS-DOS 6.2.2 on some old hand-me-down PC with a 20MB hard drive at the tender age of 11 or 12, but that doesn’t mean I’m interested in trying to do it again. I roll with whatever new software companies push out, even if it requires small changes to my workflow. In the long run it’s just easier to do that than it is to declare you won’t ever upgrade again because someone changed something in a way you didn’t like. What’s that adage—something about being flexible enough to bend when the wind blows, because being rigid means you’ll just break? That’s my approach to computing. 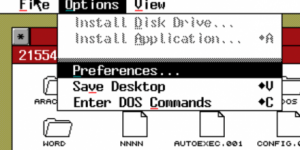 Open source MS-DOS alternative lives—but using it nearly killed me. I have fuzzy, vaguely fond memories of running the Mac version of Oregon Trail, playing with After Dark screensavers, and using SimpleText to make the computer swear, but that was never a world I truly lived in. I only began using Macs seriously after the Intel transition, when the Mac stopped being a byword for Micro$oft-hating zealotry and started to be just, you know, a computer. So why accept the assignment? It goes back to a phenomenon we looked at a few months back as part of our extensive Android history article. Technology of all kinds—computers, game consoles, software—moves forward, but it rarely progresses with any regard for preservation. It’s not possible today to pick up a phone running Android 1.0 and understand what using Android 1.0 was actually like—all that’s left is a faint, fossilized impression of the experience. As someone who writes almost exclusively about technology at an exclusively digital publication, that’s sort of sobering. You can’t appreciate a classic computer or a classic piece of software in the way you could appreciate, say, a classic car, or a classic book. People who work in tech: how long will it be before no one remembers that thing you made? Or before they can’t experience it, even if they want to? So here I am on a battered PowerBook that will barely hold a charge, playing with classic Mac OS (version 9.2.2) and trying to appreciate the work of those who developed the software in the mid-to-late ’90s (and to amuse my co-workers). We’re now 12 years past Steve Jobs’ funeral for the OS at WWDC in 2002. 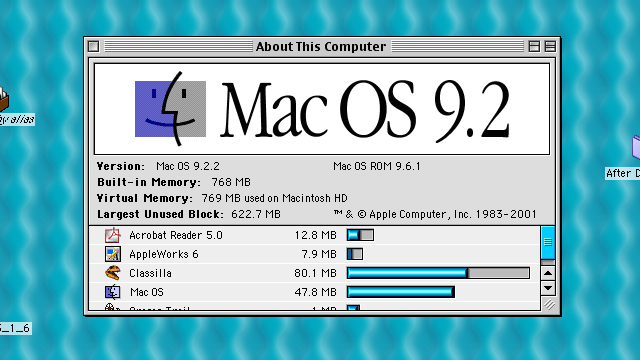 While some people still find uses for DOS, I’m pretty sure that even the most ardent classic Mac OS users have given up the ghost by now—finding posts on the topic any later than 2011 or 2012 is rare. So if there are any of you still out there, I think you’re all crazy… but I’m going to live with your favorite OS for a bit. Enlarge / My weapon of choice: a 2002 titanium PowerBook G4. My first task was to get my hands on hardware that would actually run OS 9, after an unsuccessful poll of the staff (even we throw stuff out, eventually). I was told to find something usable, but to spend no more than $100 doing it. You’d think it would be pretty easy to do this, given that I was digging for years-old hardware that has been completely abandoned by its manufacturer, but there were challenges. 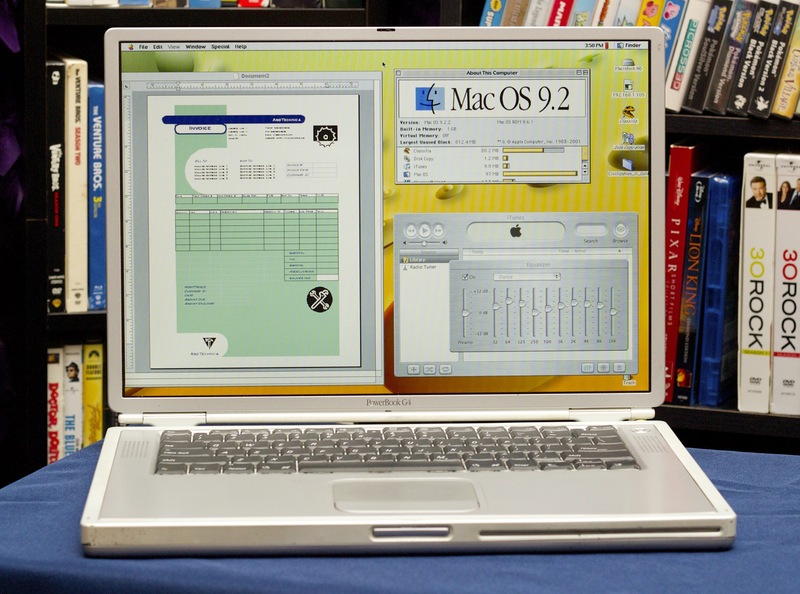 Certain well-regarded machines like the “Pismo” G3 PowerBook have held their value so well that working, well-maintained machines can still sell for several hundred dollars. Others, like the aluminum G4 PowerBooks, are too new to boot OS 9. They’ll only run older apps through the Classic compatibility layer in older versions of OS X.
I didn’t want to deal with the pain of an 800×600 display, so the clamshell G3 iBooks were out, and I never really liked the white iBooks at the time—I found their keyboards mushy and their construction a little rickety. White plastic iBooks and MacBooks were never really known for their durability. Anything with a G3 also rules out support for OS X 10.5, which I’d want to install later to actually get stuff done on this thing. The laptop I decided to go with was the titanium PowerBook G4. While these weren’t without quality issues, they at least promised usable screen resolutions and Mac OS 9 compatibility. They also tend to fall right where we’d want them on the pricing spectrum—old enough to be cheap, but not so old or well-loved to be collectors’ items. Welcome to WWIII, lets hope we can stick with “conventional” weapons. Chris Johnston here with an update on the RAF action over Iraqtoday. 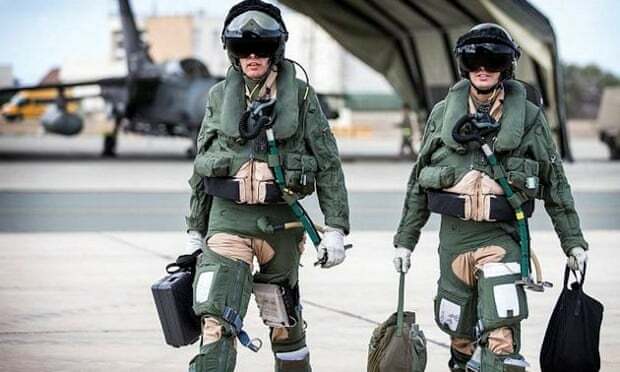 The Ministry of Defence has confirmed that “no targets were identified as requiring immediate air attack” by the two Tornado fighter bombers that have returned from RAF Akrotiri in Cyprus. Furthermore, we know that the very presence of coalition airpower over Iraq has a significant impact on [Islamic State’s] efforts to attack the Iraqi people. With no effective defence against air strikes, and knowing the precision with which coalition aircraft can hit them, the terrorists are forced to be much more cautious, keeping their forces dispersed and movement inhibited. They also know that should they concentrate to deliver an attack against Iraqi or Kurdish troops, aircraft are likely to arrive overhead very soon afterwards. 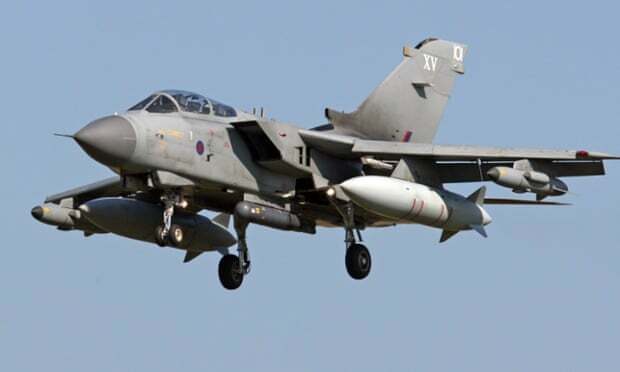 • The first two RAF Tornado jets involved in combat missions against Islamic State in northern Iraq have taken off from the RAF base at Akrotiri in Cyprus after MPs sanctioned a UK air assault against targets. Prime Minister David Cameron said that Britain was one part of a large international coalition, adding that a “crucial part” of that coalition is led by the Iraqi government. • US-led coalition warplanes have struck jihadis attacking a town near the border between Syria and Turkey for the first time, as well as positions including wheat silos, say activists and a Kurdish official. A spokesman for Syria’s Kurdish Democratic Union Party, or PYD, said some of the strikes targeted for the first time Islamic State group positions near the northern town of Kobani, also known as Ayn Arab. • Barack Obama used his weekly address to say American leadership was “the one constant in an uncertain world”. “America is leading the world in the fight to degrade and ultimately destroy the terrorist group” known as Isis, Obama said. • New legislation, to be introduced by the end of November, will give police in the UK powers to seize the passports of people trying to join Isis, according to Theresa May, the home secretary. In an interview with the Times, she says the new laws will make it easier to prosecute those involved in preparing terror acts abroad. The understanding is that the jets did not set off with any specific targets and, indeed, it’s possible that they did not attack any targets at all. We’re hoping to get some clarification on that from the Ministry of Defence in the coming hours. As British jets took off from Cyprus earlier today as part of combat missions against Isis in Iraq, US President Barack Obama was using his weekly address to say American leadership is “the one constant in an uncertain world”. America is leading the world in the fight to degrade and ultimately destroy the terrorist group. I made it clear that America would act as part of a broad coalition, and we were joined in this action by friends and partners, including Arab nations. US President Barack Obama says in his weekly address that US leadership is leading the world in the fight to degrade ‘and ultimately destroy’ Isis. US coalition-led warplanes have struck jihadi positions near the Turkish border for the first time, according to the Associated Press. Targets were said to include wheat silos in the country’s east, say activists and a Kurdish official. Nawaf Khalil, a spokesman for Syria’s Kurdish Democratic Union Party, or PYD, said some of the strikes targeted for the first time Isis positions near the northern town of Kobani, also known as Ayn Arab. The town has been under attack by jihadis for days and Khalil said the strikes destroyed two tanks. He said the town was later shelled by jihadis, wounding several civilians. Away from the air and ground war against Isis, there’s also a digital war of course. The New York Times has an interesting piece based on an interview with Richard A Stengel, the US under secretary of state for public diplomacy, who has been talking about how the US is countering online propaganda with its own response. We have to be tougher, we have to be harder, particularly in the information space, and we have to hit back. a communications coalition, a messaging coalition, to complement what’s going on the ground. Operations from the US side revolve around the Center for Strategic Counterterrorism Communication, which engages in online forums in Arabic, Urdu, Punjabi and Somali. Posting on social media platforms including Twitter and Facebook, members of the unit question claims made by Isis and draw attention to alleged cases of jihadist brutality. Militant groups in other countries including Somalia and Nigeria are also targeted. Another image released by the Ministry of Defence shows two Tornado GR4 aircrew preparing to depart this morning from RAF Akrotiri in Cyprus. The aircraft are armed with Paveway IV laser guided bombs and are operating as part of what is now known as Operation Shader. More detail now on that RAF deployment. It involves two Tornado GR4 bombers supported by a Voyager air-to-air refueling aircraft. They took off from RAF Akrotiri on Cyprus at 8.30am (UK time). We can confirm that, following parliamentary approval given yesterday, RAF Tornados continue to fly over Iraq and are now ready to be used in an attack role as and when appropriate targets are identified. For operational security reasons we will not be providing a running commentary on movements; we will provide an update on activity when it is appropriate to do so. 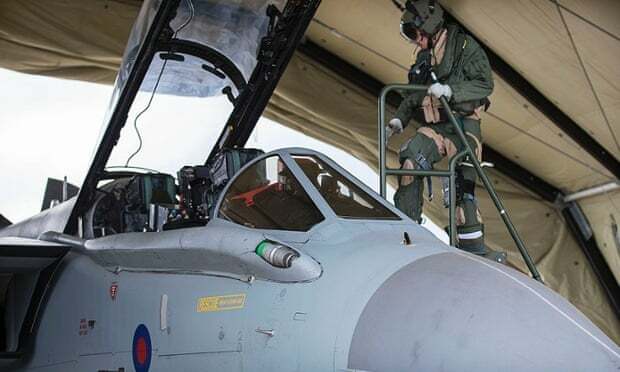 Two Tornado jets and a refuelling aircraft have taken off from the RAF base at Akrotiri Cyprus, according to Britain’s Ministry of Defence (MoD). The MoD has just lifted an embargo on the reporting of the departure of the aircraft this morning. It’s believed that they are still in the air over Iraq at the moment. The mission is an extension of the reconnaissance work which the Tornado planes have been doing for some time but they are now ready to be used in an attack role following yesterday’s parliamentary vote. Turkish troops could be used to help establish a secure zone in Syria if there was an international agreement to establish such a haven for refugees fleeing Isis, according to the Turkish president, Tayyip Erdogan. In the distribution of responsibilities, every country will have a certain duty. Whatever is Turkey’s role, Turkey will play it. You can’t finish off such a terrorist organisation only with airstrikes. Ground forces are complementary … You have to look at it as a whole. Obviously I’m not a soldier but the air (operations) are logistical. If there’s no ground force, it would not be permanent. Michael Young, an opinion editor at Lebanon’s English-language Daily Star newspaper, has written a piece suggesting that the logical outcome of military operations in Syria against Isis is likely to be pressure for a political solution that leads to Bashar al-Assad’s departure from power in Syria. Applying the same logic as in Iraq, the Americans are also likely to soon conclude that only a more inclusive government in Syria can consolidate the gains made against Isis. In Iraq, the aim was to bring Sunnis into the political process, in the belief that they are necessary to defeating Isis, and to do so the Obama administration helped remove Prime Minister Nouri al-Maliki. Why should Syria be any different? Isis militants are changing tactics in the face of foreign air strikes in northern Iraq, according to the Al Arabiya news channel, which says that sources on the ground have said that they are ditching conspicuous convoys in favour of motorcycles and planting their black flags on civilian homes. They say that there has been fewer checkpoints and less cell phone use since the air strikes intensified. They took all their furniture, vehicles and weapons. Then they planted roadside bombs and destroyed the headquarters. They don’t move in military convoys like before. Instead they use motorcycles, bicycles, and if necessary, they use camouflaged cars. 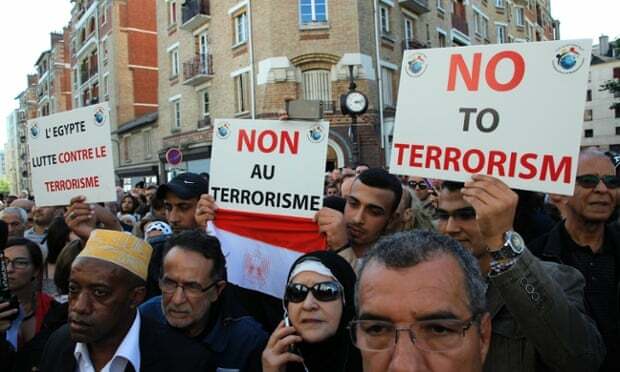 Muslim associations in France have called for a large demonstration tomorrow in Paris against violence, days after the killing of a Frenchman by a self-proclaimed Algerian ally of Isis. Hundreds of French Muslims took to the streets of Paris and other French cities yesterday to protest against Islamic State, following similar moves by Muslims in the UK. Another of the MPs who voted against UK involvement in air strikes, Mark Durkan of the SDLP, has been outlining his reasons. Whilst I can fully understand those who want to respond in a sharp way – especially given the nature of what [Isis] has done and we know are capable of doing – I am still not convinced that these measures can be effective in the precise way that people claim. We have had all sorts of claims in the past about precision airstrikes in Afghanistan and elsewhere which have led to the deaths of thousands of innocent people. The SDLP, often described as Labour’s sister party in Northern Ireland, has traditionally taken the Labour whip in the House of Commons. 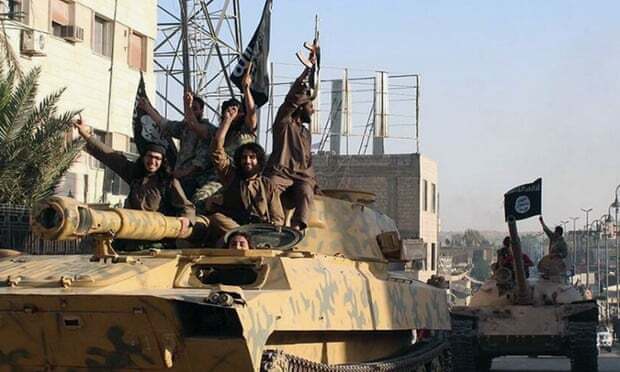 Isis fighters on the outskirts of the Syrian town of Kobana, near the border with Turkey, have also been targeted by air strikes, according to reports from the area quoted by the BBC. The BBC’s Paul Wood has reported that aircraft circled overnight and explosions were heard in the area in the early hours of the morning. David Cameron has been speaking today ahead of British involvement in air strikes, saying that the UK was ready to “play its part” against Isis and asserting that the Iraqi government is playing a “crucial” role in the coalition assembled against the jihadists. We are one part of a large international coalition. But the crucial part of that coalition is that it is led by the Iraqi government, the legitimate government of Iraq, and its security forces. We are there to play our part and help deal with this appalling terrorist organisation. New legislation, to be introduced by the end of November, will give police in the UK powers to seize the passports of people trying to join Isis, according to the Home Secretary, Theresa May. In an interview with the Times today, she says that the new laws will make it easier to prosecute those involved in preparing terror acts abroad. The home secretary, who said that authorities believed that more than 500 British muslims had now traveled to Iraq and Syria, referred to the threat which she believed may come about as a result of the eventual return to the UK of radicalised and battle-hardened jihadis. The picture is complex. What we know is that Syria is proving to be a bigger draw for people coming from the UK than any other area. The concept of people going for fighting and training abroad is not a new one. People have gone to Somalia, to Fata [Federally Administered Tribal Areas, Pakistan’s tribal regions] and so on but it’s the numbers going to Syria that makes this different. Apple removed an update of its iOS mobile software following user complaints. WSJ’s Daisuke Wakabayashi reports on the News Hub with Lee Hawkins. Photo: Apple.com. Apple Inc. is confronting a botched software update and consumer complaints that its flagship phone can be bent out of shape, just one week after launching its new iPhones. In a rare move Wednesday, the Cupertino, Calif., electronics maker yanked an update to its latest iPhone, iPad and iPod software hours after making it available. Some owners complained the software had disrupted their phone’s ability to make calls and disabled the TouchID fingerprint sensor used to unlock devices. IN OTHER REPORTS, USERS COMPLAINED THAT THEY WERE UNABLE TO MAKE CALLS. The software glitch followed reports that customers accidentally bent the iPhone 6 Plus—Apple’s largest and at $750 without contract its most-expensive phone—by sitting with the phone in their pants pocket. Videos of people bending the jumbo-sized iPhone with their hands quickly made the rounds on social media. Together, the issues are embarrassing for Apple at a time when it is hoping to sell a record number of phones. The negative publicity contrasts with largely favorable reviews for its new iPhones and Apple’s announcement of strong initial sales. Apple confirmed it withdrew the update to its iOS 8 software, but declined to say how many people initially had downloaded it. The company also declined to address reports of the larger phones warping. 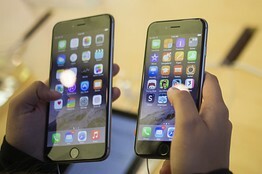 Apple recommended that users affected by the software problems connect their iPhones to a computer running iTunes to reinstall the previous version of iOS 8. In a statement, Apple apologized for the “great inconvenience” and said it is “working around the clock” to prepare an iOS 8 update for release in the next few days. Ryan Orbuch, an app designer, said he installed the software update on his iPhone 6 as soon as it was available, but then noticed poor cellular reception and that TouchID wasn’t working. Apple “shouldn’t ship a [software] build like that,” he said. It is not uncommon for updated versions of an operating system—especially one used by millions of people on different devices—to report issues in the early days after their release. Major product releases also tempt some people to perform extreme tests that aren’t indicative of everyday use, which then gain attention on social media. “It’s a PR headache, but it doesn’t affect how consumers view Apple and it’s not a sign that something is fundamentally wrong at Apple today,” said Carolina Milanesi, chief of research at Kantar Worldpanel. Apple has had problems with new releases in the past. Its mapping software initially drew scorn when it replaced Google Inc. GOOGL -1.89% ‘s Maps as the default software on iPhones in 2012. The iPhone 4’s debut in 2010 triggered complaints about poor reception and dropped phone calls, a problem former Chief Executive Steve Jobsdisparagingly called “antennagate.” Apple later changed the design of its antenna to alleviate the problem. There were complaints in 2009 about stress fractures in the iPhone 3Gs. In early versions of 2011’s iOS 5 release, there were reports that the software was draining the phone’s battery. Its iOS 6, released in 2012, brought reports of poor connectivity and dropped calls; Apple issued an update to fix the issues. Apple didn’t respond to a question of whether it had previously withdrawn an iOS update. Apple released the update, the first for its new iOS 8 operating system, earlier Wednesday with the goal of fixing various software bugs. About an hour after releasing the update, Apple pulled the new version of the software to investigate reports of problems. In a nod to “antennagate,” the term “bendgate” became a trending topic on Twitter.TWTR -1.78% The bending issue centered around the larger of Apple’s two new iPhones. The iPhone 6 Plus with a 5.5-inch display measured diagonally is the largest iPhone that Apple has ever produced. Despite the larger surface area, the iPhone 6 Plus is only 7.1 millimeters thick, compared with 7.6 millimeters for the iPhone 5S and 8.97 millimeters for the plastic-encased iPhone 5C. Many consumer products—particularly those encased in malleable aluminum—will bend when enough pressure is applied. The question facing Apple owners is whether their iPhone 6 Plus could withstand a reasonable amount of force exerted from everyday activities like sitting. Carbon Politics and the Failure of the Kyoto Protocol is a new book from the Managing Director of Sixth Element Sustainable Management, Dr. Gerald Kutney. The book has been published by Routledge – Earthscan. Carbon Politics and the Failure of the Kyoto Protocol charts the framework and political evolution of the Kyoto negotiations in search for an answer to the failure of the international community to act on climate change. The focus is not on the science or consequences of climate change but on the political gamesmanship which has been pervasive throughout the Kyoto negotiations by the major players. The influence of politics on the Kyoto process has been well studied, and Carbon Politics is more than an updated history of the subject matter. What is new is the detailed study of the Kyoto targets which became a major influence on the reaction of nations to Kyoto, arguably more than any other. An objective of the book is to identify what went wrong with Kyoto and to clear up popular misconceptions on global leadership on climate change legislation. Without such knowledge, a way forward to reduce global emissions cannot be achieved. At the end of Carbon Politics, framework and policy suggestions are made to lower emissions going forward. The evidence indicates that a fundamental cause of the failure of the Kyoto negotiations is the inequitable carbon targets. Contrary to the absolute value of the reduction in carbon emissions, the Kyoto targets of the EU and even Germany were far easier to achieve that those of the U.S. (and Canada). The EU had taken advantage of their position to improve their international competitiveness by forcing other developed nations to take on the burden of similar targets, even though the Europeans could just follow business-as-usual approaches to reach these goals. No one wants to play a game when the rules favor their opponents. Chapter 1 on the background of the Kyoto negotiations and the politics of the IPCC. Chapter 2 on glaciergate and the role of political climate skeptics. Chapter 3 on policy development in the US and China. Chapter 4 on policy development in the EU. Chapter 5 on seeking simple solutions to climate change. Before most of us had gotten up close and personal with Apple’s new iPhones, the website BGR ran a post provocatively titled: “The truth hurts, Apple fans: You can thank Samsung for your big new iPhone displays.” Samsung liked it so much, it was featured in its new Apple-mocking ad, which reminds the world that Samsung — often the copier – was indeed first to market with a giant-screened smartphone. And it took years, literally, before Apple realized Samsung was onto something with its Galaxy Note phablets. But the folks in Cupertino have responded, producing not just the iPhone 6, but the 5.5-inch iPhone 6 Plus. To paraphrase Apple’s design chief Jony Ive it’s “beautifully, unapologetically a phablet.” And it wouldn’t exist were it not for Samsung and the fantastic market success of the Note series. So in a hat tip to BGR, I’m thanking Samsung as I marvel at the gorgeous iPhone 6 Plus, #phabulous. The Note, as Samsung likes to remind us in an ad that is honestly mystifying in its purpose, wasn’t well received by critics at first. In that respect, it joins the iPhone, iPad, Macbook Air and iPod — Apple’s big four of mega-hit products from the new millennium. Thanks to Stefan Constantine, who produces Tab Dump, I have some data handy on how each generation of Note has been far more successful than the one before. The original took 9 months to sell 10 million units. The Note 2 bettered that by half, reaching the mark in just 4 months. And the Note 3 halved the time again. Samsung’s Galaxy Note 4 is due to arrive imminently and while it seems unlikely it can pull off the feat of selling 10 million in just 30 days, it’s absolutely fair to say it has become a big hit for Samsung. Indeed, it has spawned imitators from LG, Sony, HTC and even Nokia, all with screens bigger than the iPhone 6 Plus’ 5.5-inch diagonal. Given that the Note invented popularized* the segment just 3 years ago, phablet growth has been nothing short of staggering. IDC sees 175 million being shipped in 2014, which is likely not far from the total number of iPhones Apple will ship in the calendar year. But if IDC is right, phablets are going to rocket past both the iPhone and also PCs next year. The firm see 318 million phablets being sold in 2015 against just 300 million PCs — and 233 million larger tablets. If that’s not impressive enough growth, IDC believes phablets will reach 593 million sold in 2018, growing 60% compounded over the next four years. Phablets are far and away the fastest growing segment in mobile, indeed in all of technology right now. Those numbers, Apple could not ignore, in much the same way it brought out the iPad Mini after initially rejecting smaller tablets as a bad idea. As with the Mini, when Apple decides to join in, it does so with a bang. The iPhone 6 Plus is a stunning device. It has what might be the finest screen on any smartphone, certainly a worthy competitor to the current crown holder, Samsung’s Galaxy S5. The smooth curves of the all-metal body feel nearly seamless as they meet the gentle curve of the front glass. The large screen necessarily makes it the biggest iPhone to date, but it’s barely an ounce heavier than the 4s and thinner than an iPhone 5. Phablets hold special appeal in Asia, where personal computers never reached the penetration they have in the U.S. and the idea of one single device that’s almost good enough for everything is especially desirable. I’ll have a more detailed look at this later, but it’s not unreasonable to argue if that was your goal, the iPhone 6 Plus would be as close to perfect as you could get right now. The wide array of iOS apps, the much improved ability to type on the larger screen, and the fantastic visuals make the 6 Plus one of the finest computers Apple — or anyone — has ever built. But absent Samsung pushing the boundaries of size in smartphones, it seems unlikely Apple would ever have made such a device. While Apple’s history wasn’t as a one-size-fits-all company, it has taken a harder line with the iPhone. When everyone else kept moving larger, Apple focused on one-handed use and keeping the iPhone screen small enough to make that possible. And while it still sells those smaller phones in the now-less-expensive 5s and 5c, Apple only brought its newest and best features to the larger 6 and 6 Plus. The phablet, in fact, got unique capabilities the smaller model didn’t, including the best camera, display and battery life. Seven years ago, it was reasonable for the New York Times to write: “Now, there will be plenty of people who will pass on the iPhone … who find the iPhone too big.” For a while now, many of us have been saying for a long while the iPhone has become to small: At least offer the option of bigger screens like those from Samsung. Ive and the rest of iPhone team at Apple have delivered, producing a phablet that’s so popular it’s selling out everywhere. BGR suggest that it’s even bringing some Android users over to the iPhone camp. Whether Apple would choose to admit it or not, the competition with Samsung and others is a good thing for the company. Each copies some of the best features from the other and tries to produce something new and appealing to draw in customers. Early returns indicate Apple has done that with the 6 Plus. The company — and all the buyers — owe a debt of thanks to Samsung.